"Where all practices and competitions start and end..."
Locker rooms. While not exactly exciting to talk about, these spaces are a necessity for any athletics complex, and they're imperative for our sports teams. In fact, the locker rooms are where all practices and competitions begin and end. Designated team locker rooms are a significant--and much needed--component of the proposed renovations to Luther's Regent's Center. Gone are the days of simply lockers and shower rooms. Today's modern locker rooms are not just places to change clothes and clean up. They provide designated team spaces for game prep, video review, and meetings among coaches and student-athletes. Team locker rooms are important spaces to create team unity and hold both formal and informal meetings. "The addition and renovation of locker rooms for our athletic teams is exciting and necessary. Creating quality spaces to study and relax outside of practice shows our commitment to our student-athletes." 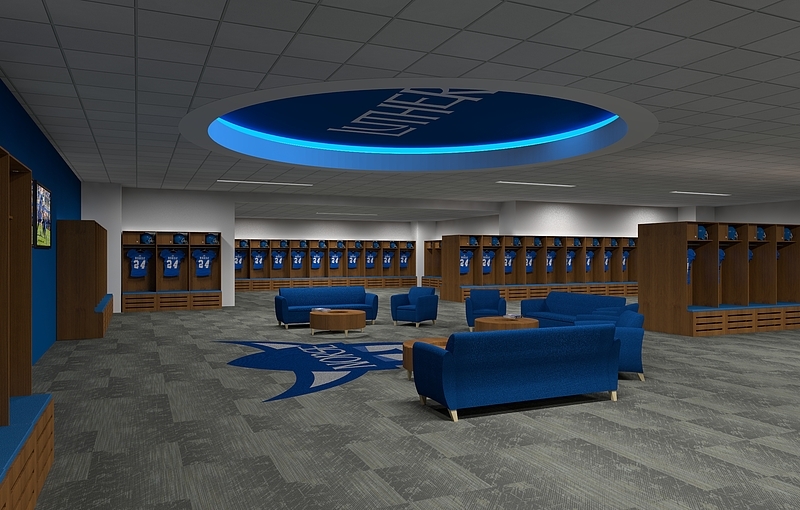 "New locker rooms will provide us an opportunity to build the Norse brand and create spaces that appeal to recruits, unify our student-athletes, and showcase the proud history of Luther College athletics."